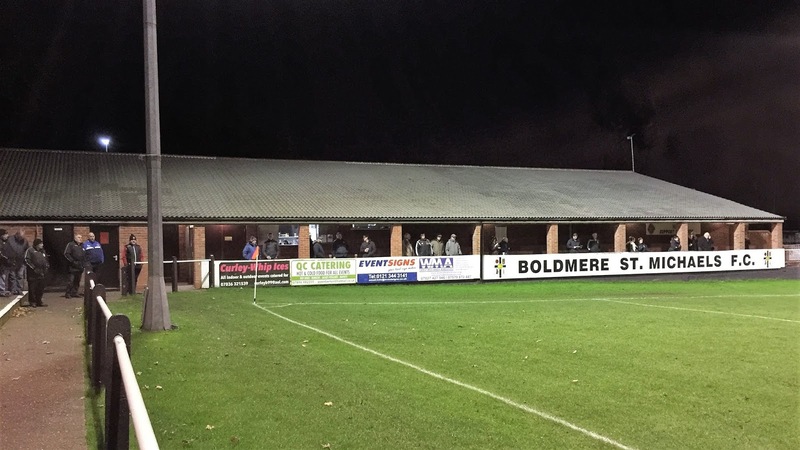 BOLDMERE ST MICHAELS were formed in 1883, originally as a group of youngsters playing as a local church side. They progressed to a men's team once all the players grew older and played in various local leagues, being champions of the Midland Combination on 3 occasions. 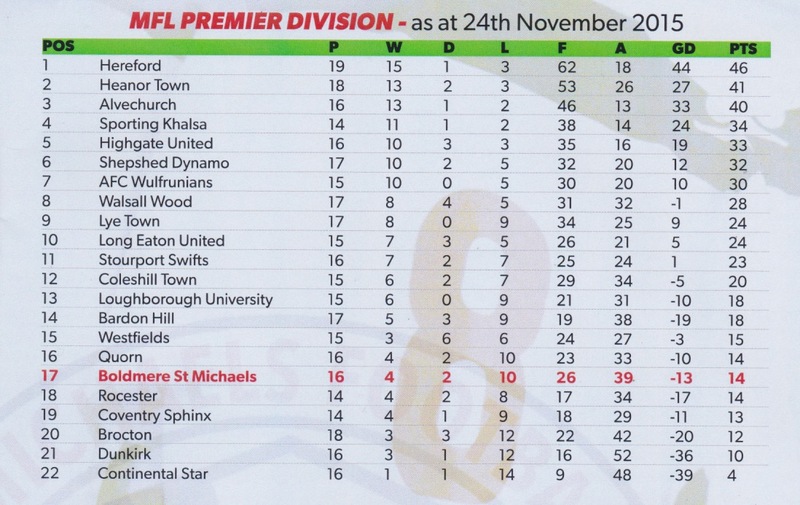 For the 1994/95 season, they joined the newly formed Midland Alliance which currently sits at step 5 of non-league and which was renamed the Midland Football League Premier Division a couple of seasons ago. In the last season of it being known as the Alliance, 2013/14, they had their best season in that league, finishing 2nd behind league champions Tividale. 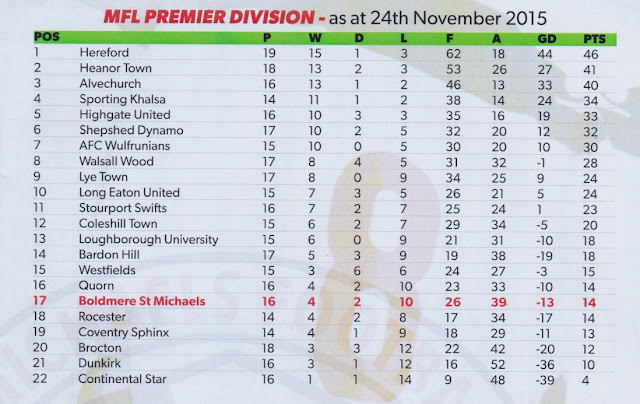 Prior to the game, they sat in a rather disappointing 17th place, though having seen quite a few teams play from the Midland League, this is one of it's strongest seasons yet. Despite several attempts, the clubs best progression in the FA Cup remains the 2nd Qualifying round which they last reached in 1997-98. That year they beat Long Buckby & Wroxham before going out to Woodbridge Town. In their only season in the FA Amateur Cup, they reached the semi-final back in 1948 before losing to Barnet in a game played at Arsenal's Highbury Ground. 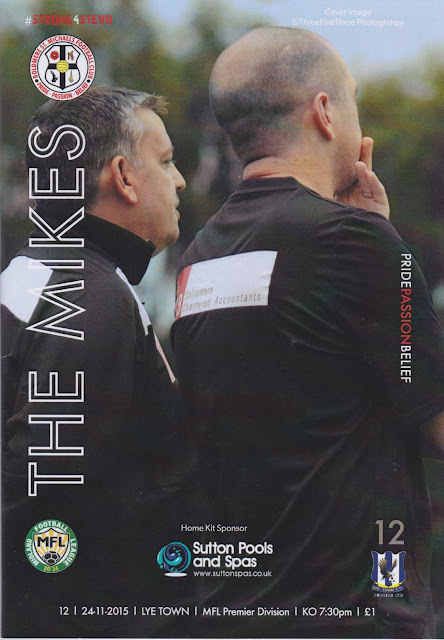 In its replacement, the FA Vase, the club has reached the 3rd Round on a number of occasions, the most recent being 2010 when they lost out to Vase specialists Whitley Bay. Several local trophies have been won, most recently the Midland Football Combination Challenge Bowl in 2011. I was on my own again groundhopping wise for this Tuesday and so I had free choice of where to go. I had a strong preference for an FA Vase game, having not seen a game in the competition since Ashford United lost 5-0 to Norwich United in January. I was also hoping for a cheapish night out as the 2 last games at AFC Wimbledon and AFC Totton had cost me a bit, what with travel and other matchday costs. So I was really pleased when FC Broxbourne Borough v Greenhouse Sports came up on the fixtures for the FA Vase, what with it being one of my nearest 'ticks'. The weather seemed OK too with overnight rain forecast on Monday, but nothing that looked like it could put the match in danger. The original game had been postponed on Saturday due to the weather, and as a consequence, both sides had agreed to settle the game on the night - with extra time and penalties if needed. I did, of course, have backups in place, should the worst happen and the game be called off. The weather had been absolutely freezing over the weekend, seemingly going from pretty warm to the ice age in the space of a week. Luckily it had gone back to more reasonable temperatures in midweek, or more games might have been in jeopardy. On the day of the game there was rain forecast in the morning, but luckily it never came, as I enjoyed my weekly 8-mile walk to Wycombe and back, where I got a few bits for dinner. There had been various stories of farce in the FA Vase, most notably in the Morpeth v 1874 Northwich game. Proving they had no common sense, the FA insisted the tie be played tonight after the original game was called off on Saturday. Unable to raise a team due to players working and the game being 190 miles away, 1874 were forced to forfeit when they couldn’t fulfil the fixture. And the competition is supposed to be regionalised at this stage as well. I spent the afternoon at home, watching some of the TV I had missed after going to bed at 8.30 last night. The latter part of the afternoon was spent checking that my originally planned game was on, sadly at 5.15 Greenhouse Sports (the away side) tweeted that the game was off, and it was announced that the game had also bitten the dust on the Non-League Matters Forum. There still no confirmation from the home side to make sure there had not been a mistake 15 minutes later, indeed as of 4PM the following afternoon no one has updated their Twitter to inform the public that the game was off, so it's lucky I check multiple sources to keep in the loop. I knew that I'd have to get a shift on if I wanted to get to my second choice game, Highgate United v Nuneaton Griff in time. That was still scheduled as 'game on' and I sent a tweet to the club asking for confirmation. Fellow hopper Alex, who was in the Midlands and who also had the game on his radar was confident that it would go ahead. He said that there had been no overnight rain and that the pitch was normally OK. I did try to phone the number listed on the website for Highgate United, but it came back as an unrecognised number. After getting my things together, I left at 5.40, making decent progress considering it was the rush hour. 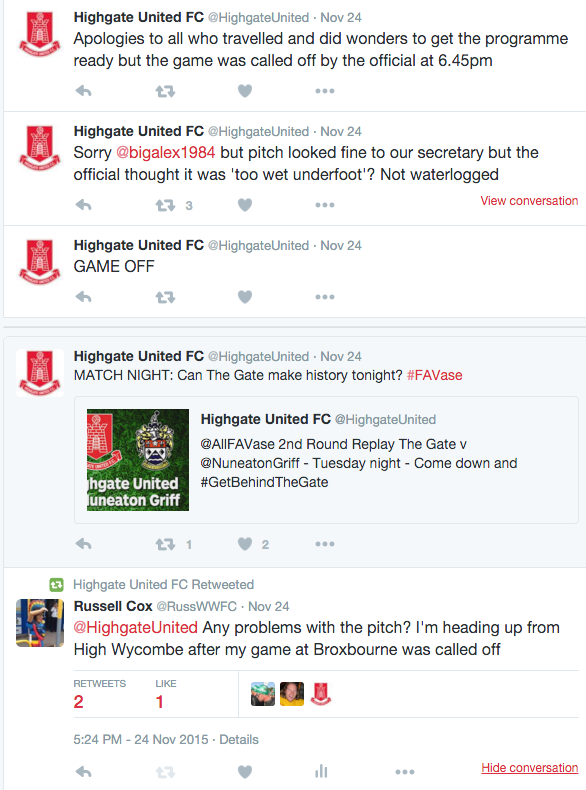 I must have been around Oxford when a tweet from Highgate came through 'confirming' that there were no problems and that the game was on. I was delighted that I'd not have a wasted journey and went up through Warwickshire in a decent mood. However, just as I passed the last place that I could exit the M40 I received another tweet, saying that the referee had called the game off with an hour before kick off. I read later that players and supporters were already there, and I was as annoyed as they must have been at the late postponement. Credit to the Highgate United twitter though for keeping me informed, but it was another 20 minutes before I finally found a place to pull over, which happened to be 2 miles from my original destination. I went to the boot to get my non-league paper and had a quick scan of any games that were in the Midlands. 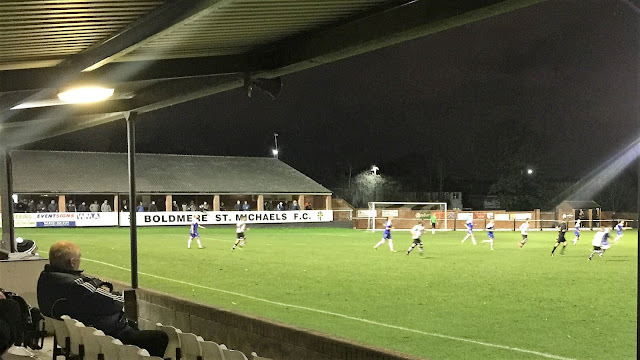 Boldmere St Michaels came up trumps and after checking their twitter, it was confirmed game on, but with me 20 miles away and my ETA 7.40 it was going to be tight to make kick off. Who knows if there was something closer, I wasn't going to hang around looking at other options. I actually drove past Highgate United on the way back to the M42, which was now in darkness. Luckily I made up some time and got to Boldmere 5 minutes early, parking up at 7.35. I was at the turnstile a couple of minutes later and seeing that the teams were already on the pitch and playing, found out it was a 7.30 kick off. The gateman told me I'd not missed much and charged me a well-priced £5 to get in. This is what I feel is a fair price for step 5 football, but very few clubs are able to go this low due to operating costs. I also picked up another bargain, and an excellent programme for £1 which was very well presented with all glossy pages and a fair bit to read too. I watched the first 5 minutes from behind the goal in front of the turnstile before going round to the stand, getting pictures as I went. As for the game, it was entertaining from the off, at least from what I saw of it. The visitors enjoyed most of the ball in the first half and had some chances but not many of them were clear-cut. In the second half, it turned around a bit, with Boldmere coming right back into it. 10 minutes into the second period they were ahead. Harry Howard's run and cross from the right found Simeon Maye. His drilled shot hit the left-hand post before rolling along the line and going in. Things got worse for Lye moments later - an accidental clash of heads between players led to Alex Dallison getting concussion and having to be stretchered off. Some tasty tackles were now flying in, but it was an off the ball incident that I didn't see which led to the visitors Dreniz Bala getting his marching orders, well spotted by the eagle-eyed linesman. 83 minutes in the hosts doubled their lead - again it was an excellent cross, this time picking out Matt Gardner who slid in at the far post. 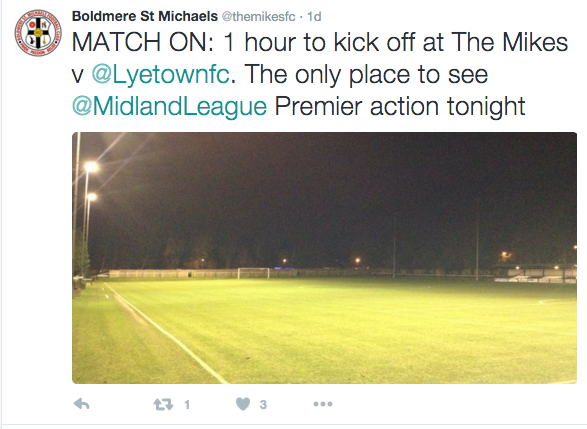 Lye did pull one back right at the death with a low shot into the bottom right-hand corner to set up a nervy finish for Boldmere. It had been a far from ideal start to the evening with me getting there late, although at least they still had programmes left, which isn't always the case, even well before kick off. I normally like to have a chill and a read of the programme before the game, but I didn't have the luxury this time. On the upside, it had been a good game to watch, the club had been nice and friendly and it was great value, even though I did blow my entire intended budget on fuel alone. It was another good journey home with me getting in at 11PM. I watched a bit of TV before going to bed around half past midnight. THE TREVOR BROWN MEMORIAL STADIUM saw a fair bit of refurbishment over the summer and I was originally considering a Friday night pre-season friendly against Aston Villa for my visit, but for reasons I can't remember I didn't go. What has resulted is a smart modern ground with hard standing all around. It's good to go for Southern League Football with a seated stand holding 200, plus more stood behind. There is also some cover behind the goal where the dressing rooms and tea bar are and the ground has an overall capacity of 2500. Talking of the tea bar, it looked to have a great range of food at nice prices, though I didn't sample anything. Neither did I check out the bar, but merchandise wise I know they do ski hats and pin badges. From what I remember from previous research there are a fair few places within walking distance if you have time. Overall, well worth a visit for a good value night out and a friendly club.